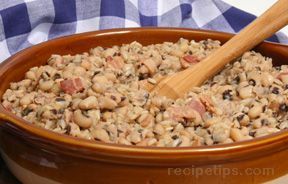 In a large Dutch oven or kettle, combine the black-eyed peas, ham bone or ham hocks, and six cups water. Cut one of the onions in half and add it to the pot along with the garlic and bay leaf. Bring to a boil, reduce the heat to medium-low, and simmer gently until the beans are tender but not mushy, two to two and one half hours. Remove the ham bone or hocks, cut off the meat; dice and set aside. Drain the peas and set aside. Remove and discard the bay leaf, onion pieces, and garlic. Add two and one half cups of water to the pot and bring to a boil. Add the rice, cover and simmer until the rice is almost tender, about ten to twelve minutes. Mince the remaining onion, then add to the rice along with the peas, tomatoes and their juices, red and green bell pepper, celery, jalapeno pepper, Creole seasoning, thyme, cumin and salt. Cook until the rice is tender, five to eight minutes. Stir in the sliced green onions and the reserved diced ham. Serve with hot sauce and freshly baked cornbread.